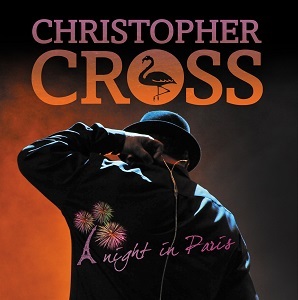 After the releasing his last studio album “Doctor Faith“, Christopher Cross embarked on one of his biggest tours in Europe in the last 15 years. His show at the Theatre Le Trianon in Paris, France was filmed by nine cameras in HD and recorded, and it is now being released as his first live album. It's surprising that it's taken him 34 years since the release of his first studio album to release a live album, but it's good that he's chosen to release one now. The album will be released on April 8th, 2013 via earMUSIC. For the ‘Doctor Faith’ tour Christopher Cross has expanded his band to include a more classical “rock line-up“: Andy Suzuki (keyboards, sax), Dave Beyer (drums), Chazz Frichtel (bass, vocals), Kiki Ebsen (keyboards, vocals), Richie Gajate Garcia (percussion). The track listing (and setlist of the concert) is a good mix of old and new. It includes five songs from the 'Doctor Faith' album and songs from a range of albums including his biggest hits - 'Sailing', 'Arthurs theme', 'Say you'll be mine' and 'Ride like the wind'. The decision to film in High Definition at first sounds very sensible - until you realise that there's no Blu-Ray version available, so the HD video is a waste really as it's been downgraded to standard definition for the DVD. I really am surprised they haven't released a Blu-Ray version as well as the CD/DVD package. Despite only being in standard definition, the video quality is good and the fact it eas filmed by so many cameras mean there are plenty of camera angles for the director to choose from to show everything to best effect. It's a great live release - a great setlist, superb quality sound and a DVD thrown in as well as the two CDs. Christopher Cross fans are going to love this album. Well worth a listen.